Welcome to Sager Creek Quilts! Sager Creek Quilts is home to an extensive selection of high quality 100% cotton quilting fabrics from today’s top designers and manufacturers including: Hoffman, Moda, Northcott, Riley Blake, P&B, Timeless Treasures, Kaufman, Maywood, Marcus Brothers, Quilting Treasures. Choose from among cozy flannels, vibrant batiks, Asian motifs, and 1930’s reproduction prints, to name just a few. 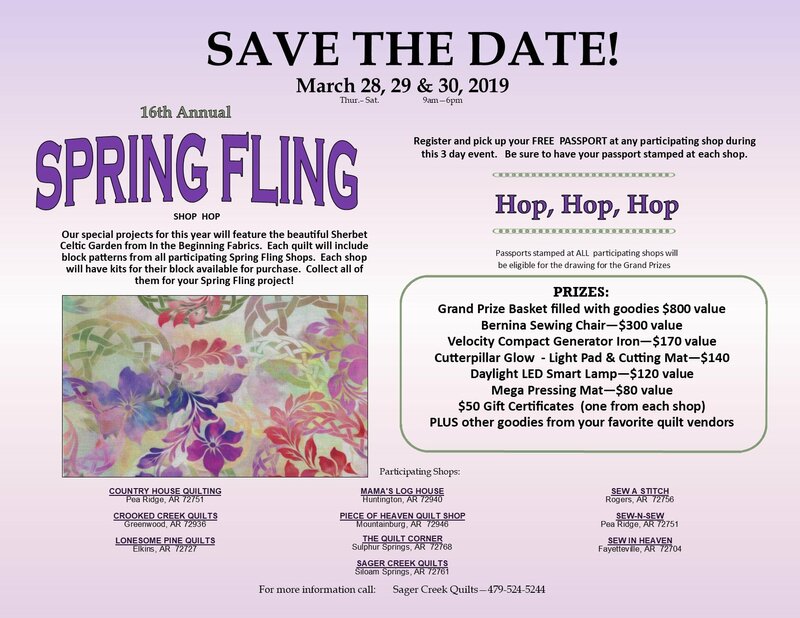 You’ll also find a variety of quilting patterns, many sewing notions, Deb Tucker's - Studio 180 Design tools, many items to satisfy a variety of creative needs and make your handcrafting experience more efficient and enjoyable. When you need help, our friendly, knowledgeable staff members are always happy to assist you, whether you’re a novice quilter or a seasoned stitcher. From our exceptional product variety to our fantastic offering of classes and our professional machine quilting services, Sager Creek Quilts is your one-stop shopping destination for quilting supplies in Siloam Springs, Arkansas!